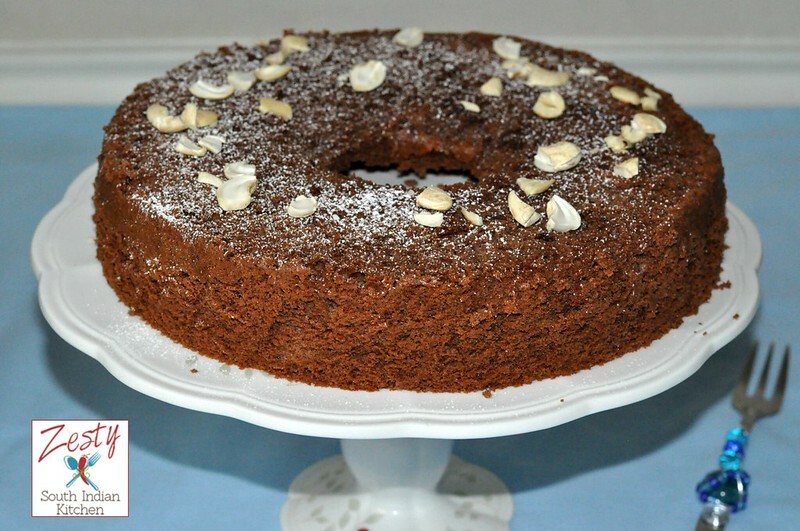 I need to bake this chocolate chiffon cake for baking partners challenge, however due to my bronchitis I didn’t bake it. But this New Year eve, my daughter asked me to bake a cake. I told her I will bake one. She wanted a brown cake. Means chocolate cake, yes she is fan of chocolate cakes and cupcakes. My little guy is also okay with any cake experiment. Angel food cake and chiffon cakes are in my do list for long time. I am scared of Angel food cake because of the number of egg white I need to make also I am afraid of crashing of the cake. When I regain my courage I am going to try Angel food cake. I thought I will suggest it is a baking partner challenge, only problem is that I couldn’t find eggless version. Yes angel food cake is made with egg whites and NO fat or leavening agents, it is essentially a meringue-egg whites and sugar, with cream of tartar for added stability, whipped to stiff peaks. Flour is folded into the meringue to help maintain the volume of the whites. However, Chiffon Cake is heavier, made with oil. The basic recipe calls for flour, egg yolks, and stiffly beaten egg whites. Baking powder provides a boost of leavening. According to General Mills, the Chiffon Cake, invented in 1927, was the first new cake to come along in 100 years. The secret of this light and fluffy cake is that the egg whites are beaten separately from the yolks, and it uses vegetable oil instead of butter or conventional shortening. It was invented by the aptly named Harry Baker, a Los Angeles insurance agent, who sold the cakes to the Brown Derby restaurant and to Hollywood stars. In 1947, Baker sold the recipe to General Mills, and it created a sensation when it was published in the May, 1948 issue of Better Homes and Gardens magazine. According to Wikipedia, It is a combination of both batter and foam type (sponge type) cake. 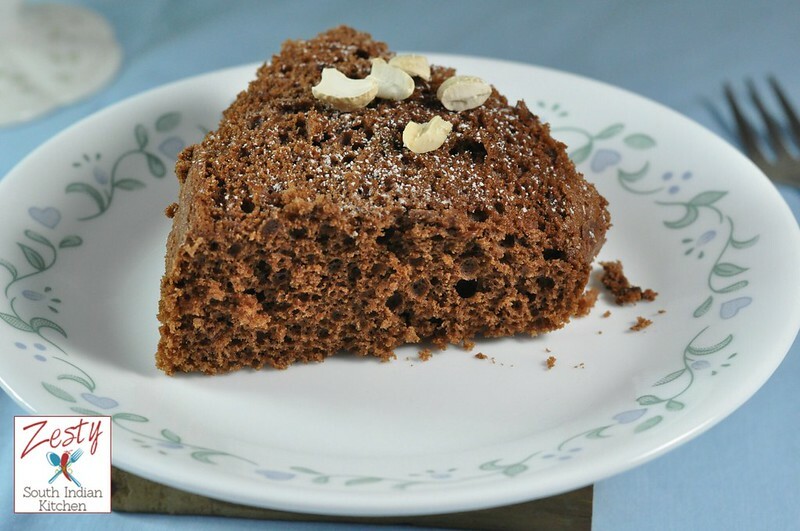 Chocolate chiffon cake was suggested by Julie of Erivyum puliyum. She suggested recipe from Joy of baking. I modified little bit. It is really hard for me to follow any recipe, without some add ons from my side my baker’s mind will not rest. I used 1 tablespoon of all purpose flour and rest of cake flour to make one cup of flour. Also added 1/5 cup of cocoa powder and used instant coffee instead of brewed coffee. When I poured the batter into the cake I was expecting a huge rise due meringue nothing happened for first 25 minutes. I was watching the cake like a little kid. Every 5 minutes I would put on the oven light and watches the cake. I even thought that it is going to be flop because my modifications. After 40 minutes I was happy because saw the rise in the cake. When it is done it was really soft. It taste great too, so give it a try, if I can make it you can also make it without any problem here comes the recipe. and the whites in another. Cover with plastic wrap and bring to room temperature (about 30 minutes). Preheat the oven to 325 degrees F (165 degrees C). You will need a 9.5 inch two piece ungreased tube pan. In a large bowl sift the flour with the cocoa powder, baking powder, baking soda, and salt. In a separate bowl whisk together the egg yolks, ½ cup sugar, oil, coffee (or with instant coffee powder and water), and vanilla extract. well in the center of the flour mixture and add the wet ingredients and whisk until smooth. Gradually beat in the remaining 1/4 cup of sugar and beat until almost stiff peaks form. With a large rubber spatula or wire whisk, gently fold the egg whites (in three additions) into the batter just until blended (being careful not to deflate the batter). and run a metal spatula or knife through the batter to get rid of any air pockets. and bake in the preheated oven for about 50 minutes or until a wooden skewer inserted into the center of the cake comes out clean. (When lightly pressed, the cake will spring back). Immediately upon removing the cake from the oven invert (turn upside down) the pan and place on a flat bottom cup (turned upside down) so it is suspended over the counter. Let the cake cool completely (about 1 1/2 hours). To remove the cake from the pan, run a long metal spatula or knife around the inside of the tube pan and center core. Dust with powdered sugar and cashew nuts and serve. It will better tasting after a day of baking. Copyright ©2015 Zesty South Indian Kitchen by Swathi(Ambujom Saraswathy) All Rights Reserved. it looks really lovely and light. hope you are feeling better. 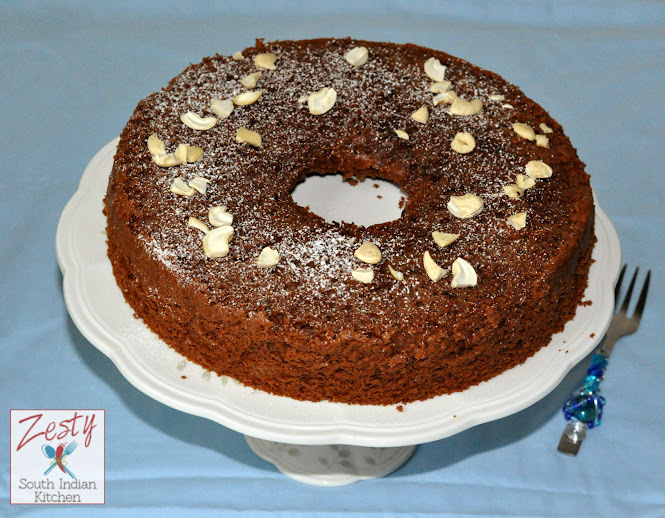 Perfect choc chiffon cake Swathi!!! Hope you’re feeling better. I’ll bake this chiffon cake again. I liked it very much. Yours is very beautiful. Swathi, chiffon cakes looks delicious, neatly explained and beautifully done! Very soft and yummy cake.. Love it! This is what I call a delicious and lovely looking chiffon cake. Excellent preparation. Such a soft and lovely cake… looks very delicious..
Love the sponginess of the cake and very chocolatey…. Soft, spongy and delicious cake swathi and Take care dear. Deliciously fluffy cake, I love how chocolatey it is without being overly heavy! It’s been a while..hope you are doing well. That’s a great looking cake. Your cake looks so light and tender! A perfect success! I would like to taste a big slice for dessert. It’s beautiful. 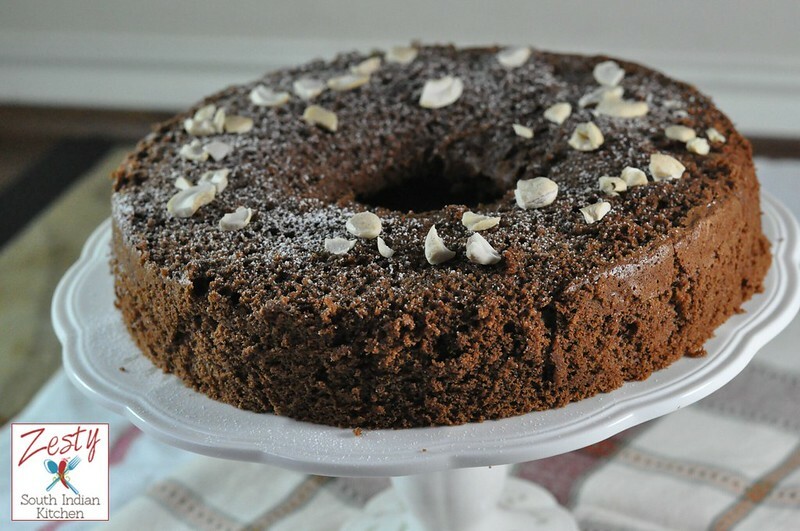 I always enjoy a moist fluffy cake like this chocolate chiffon cake. In parts of Southeast Asia, they use pandan leaves (extract) to make chiffon cake – so pandan chiffon cake is quite famous in countries like Malaysia, Singapore. Your cake sounds so delicious, Swathy! I love that you shared too the history of this cake. Thank you for sharing at our party. Pinning!